Justin Lin’s contribution to the rebooted Star Trek universe (officially named the Kelvin Timeline after the ship Nero decimated at the start of 2009’s Star Trek, an act that splintered established events into new directions) comes our way later this month, and we have our first clip from Star Trek Beyond featuring a change in the Uhura/Spock relationship, before Bones schools the Vulcan on the ways of Earth women. Check it out below. 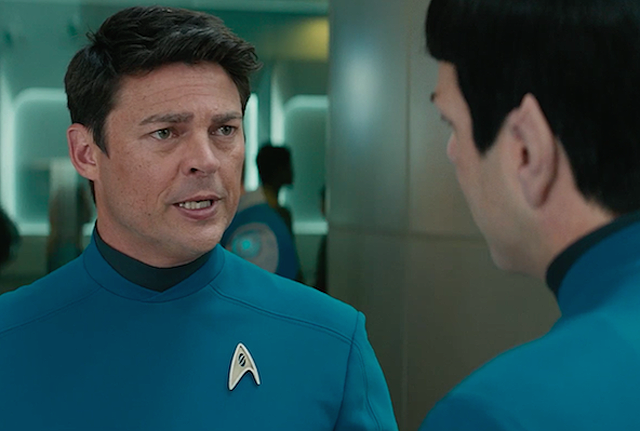 Synopsis: Star Trek Beyond,” the highly anticipated next installment in the globally popular Star Trek franchise, created by Gene Roddenberry and reintroduced by J.J. Abrams in 2009, returns with director Justin Lin (“The Fast and the Furious” franchise) at the helm of this epic voyage of the U.S.S. Enterprise and her intrepid crew. In “Beyond,” the Enterprise crew explores the furthest reaches of uncharted space, where they encounter a mysterious new enemy who puts them and everything the Federation stands for to the test.